The other day, A suddenly had a craving for this special courgettes (zucchini) dish that he used to have at home. It was a Romanian dish that his mother made often but he had no idea how to make it so I sent my mother in-law an email to find out how we could recreate it here. After she consulted her cooking notebook and translated the original recipe from Romanian to English, she sent me an email with the ingredients and instructions which we then followed to the letter. We finally had it for dinner yesterday evening and it turned out exactly as A remembered – delicious and easy to make. I guess having it after all these years brought him a taste of home and lots of memories along with it. Since it was a recipe from my belle-mere (it’s the French word for mother-in-law which just sounds so much better than English), I asked her permission to share her recipe here. Bon Appétit! Slice the top of the courgettes off and carefully empty out the insides using an apple corer (or melon baller). Soak the bread in water and leave for a few minutes. Squeeze the bread and mix with the ground beef. Saute the onion in a bit of olive oil. Add the ground beef. Season with salt and pepper. Pour the tomato sauce into a large saucepan that can fit all the courgettes . Bring the tomato sauce to a simmer. Slowly add the courgettes, side by side. Cover the pan and leave on low heat for about half an hour making sure to turn the courgettes over after about 15 minutes. Remove the courgettes from the pan and transfer onto a serving dish. Scoop on the tomato sauce and add a few dollops of cream or yogurt on top. 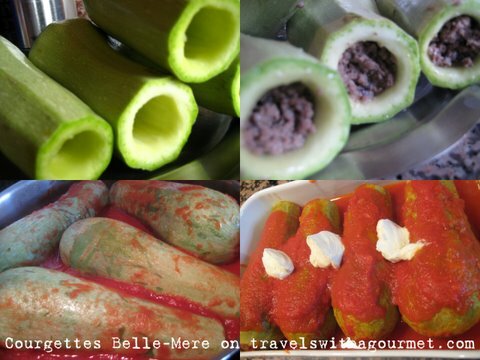 * Alternatives – you may also use a mixture of ground pork and ground beef and add some peperoncini (dried crushed red pepper flakes) to add some zing or use the same recipe and replace the courgettes for red and/or green peppers.